, a nonprofit organization that supports students with disabilities working toward their academic and professional goals in all fields, including computer science. Today we’re featuring Laura D’Aquila, a senior at MIT and 2013 recipient of the Google Lime Scholarship for Students with Disabilities. Laura is studying Computer Science/Electrical Engineering and Math enjoys playing the viola in MIT’s Symphony Orchestra and playing tennis. We recently caught up with Laura to learn more about her experience as a Google Scholar and intern. Tell us one fun, outlandish fact about yourself. I recently took up running as a hobby and ran in the Boston Half Marathon this year for the first time. I had a blast! Google recognizing me with the scholarship meant a lot to me. It increased my confidence in my ability to be successful in the computer science field, and the awesome experiences I had at the Google Scholar’s Retreat reinforced the notion that software engineering is the career path for me. I left the Google Scholar’s Retreat feeling very motivated to continue to dedicate myself in my studies so that I can ultimately have a positive impact on others through my work. What tips would you give to someone when it comes to applying for the scholarship? I think that the most important thing to get across in your application is that you're passionate about computer science and that you both have used it and plan on continuing to use it to have a real, positive impact on the world. Show some specific examples about how you've taken on leadership positions on a team project, research project, summer internship, etc. and how you’ve worked towards building something useful. The reviewers will give the scholarship to students who’ve been putting their computer science education to good use and have tangible plans to continue to do so. As for your letter writers, choose people who know you well and can attest to both your personal qualities and your technical abilities. Besides the financial benefit, what else did you gain from the scholarship and Scholars' Retreat? The Google Scholar’s Retreat excited me about the company, and by the end of an awesome few days I knew I wanted to come back to Google as an intern the following summer. The retreat provided me with some of the resources that helped make this possible – from the resume reviews to technical interview trainings to general tips for getting through the hiring process. Another highlight of the Google Scholar’s Retreat was the opportunity to participate in my first hackathon – 24 Hours of Good, a hackathon to benefit various not-for-profit organizations. It was cool to be working alongside the other scholarship recipients on projects that had the potential to have a large impact on other people’s lives. There were plenty of activities, such as yoga and lots of food, to get us through the night, and I got to know other people better while working with them throughout the night. You also interned at Google this summer. What was the best part of your internship experience? The most challenging? 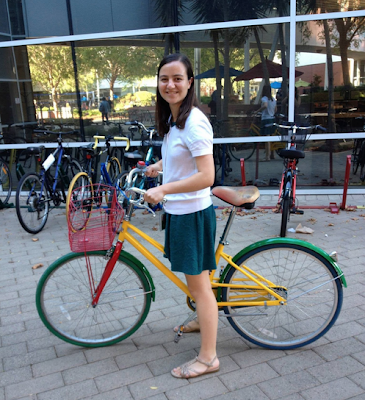 I had an amazing internship at Google that exceeded even the high expectations I had for it! I woke up every morning excited to begin the day and come to work. Everyone at Google clearly loves what they do, and the environment is very open and collaborative. It’s neat to be working on the cutting edge projects that Google has to offer that are used by people all over the world. Google places the happiness of its employees first. There’s a lot of fun things to do when you want a break, and breaks are definitely encouraged in order to maximize your overall productivity throughout the day. And you’ll certainly never go hungry working at Google with three delicious meals per day plus snacks! The most challenging part of working at Google for me was trying to stand out among many other highly intelligent and creative individuals. Google may not be the place to work at if you want to be the best one there. But I ended up loving Google’s environment since it pushed my boundaries and helped me grow. I learned so much being surrounded by some the brightest people in the world, and other Googlers were always willing to impart their knowledge on me. Do you have any advice for students who are just getting started in computer science? Follow your dreams and don’t be intimidated! There are a lot of large-scale problems in the world that still need to be solved, and as a computer scientist you’ll have the tools at your disposal to truly have an impact. Always ask yourself if things can be done better, and before you know it you’ll be working towards making that happen. If you’re interested in learning more about the Google Lime Scholarship and other scholarship opportunities, check them out on our Google for Education page. The Google Lime Scholarship was established in 2009 in partnership with Lime Connect, a nonprofit organization that supports students with disabilities working toward their academic and professional goals in all fields, including computer science.